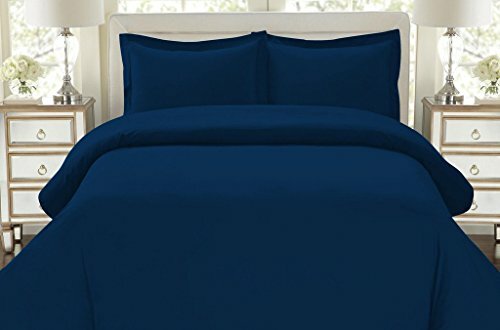 TOP QUALITY CONSTRUCTION: Duvet Cover made from Highest Quality Imported Double Brushed Microfiber grains. The Unique weaving process of Our Double Brushed Microfiber bedding results in a dense fabric having thin strands and a smooth texture. More durable and softer then Cotton! LASTING PERFORMANCE: Our Top Selling Quality Bedding Products are made with the HIGHEST QUALITY FABRIC so you know it lasts! Double Brushed fabric for OPTIMAL SOFTNESS YOU CAN SEE AND FEEL! Wrinkle and Fade Resistant; Hypoallergenic & Resistant to Dust Mites, Vibrant Colors made exclusively not to fade with washings! EASY TO CARE FOR: Machine Washable, Tumble dry low. 100% SATISFACTION GUARANTEE: Just try our products and if you don't absolutely love them let us know and we will refund your purchase price. We are so confident you will love our products like our other 5-star reviewers! You will be amazed at the customer service you receive after the sale! You have nothing to lose so ORDER NOW and consider buying an extra set for your loved ones. Makes the perfect gift for any occasion!